Here’s a great twist on the standard chip fodder. The lightly smoked components add a really savory, distinct note to a wonderful dip. 5 – 8 sprigs fresh Cilantro. Juice of 1 – 2 fresh Limes. Salt, Pepper and Chile flake to taste. Build a small charcoal pile, then spread the coals to a thin, even layer. Prepare some smoking wood of your choice by soaking it in water for about half an hour, then placing that on top of the hot coals. Cut all ingredients to be smoked in half, and leave the skins on the halved avocado. Load the grill with the avocados skin side up, and allow them to grill for a minute or two, then flip them to skin side down. Add the onion, garlic and grapefruit to the grill, then close the cover and damper the vents so the air flow is minimal, allowing the smoke to work low and slow for about thirty minutes. * NOTE: We didn’t smoke or grill the tomatoes, (Which were very fresh at the time), ‘cause they get too mushy, but my big Sis pointed out, post production, that green tomatoes are a thing of beauty, which is absolutely true: So try that option if you like, ’cause we’re sure gonna! Allow the grilled/smoked stuff to cool. Dice the tomato, onion, avocado and garlic, then combine in a non-reactive bowl and mix well. Add chiffenaded cilantro, juice from one lime, and squeeze juice from ¼ of the grapefruit. Add salt, pepper and chile flake to taste, and add additional lime and/or grapefruit juice as desired – When you get the balance right, you’ll have a nice, tangy citrus counterpoint to the smoky veggies. Was that an oops? Tomatoes are listed with onion, garlic and grapefruit as going on the grill (sounds incredibly delicious) but then you say NOT to roast or smoke the tomatoes??? Would green tomatoes work better, do you think? I love grilled green tomatoes myself…. Yeah, I’ll fix that, BUT, I like your idea better – Gonna try that! Yummers coming right up…if I still had any green tomatoes. I do have some roasted ones in the freezer; texture will be shot but flavor might be just fine..??? 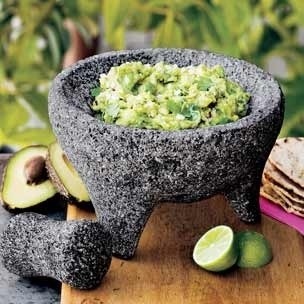 Yeah, I’d think so – and since some folks like their guacamole smooth, this should dovetail right in! Oh yeah, and show us pics of your digs so we can be properly jealous! Better enjoy while you can, Lissa. I’d have to shovel a heap of snow right now to get to the grill. But this weekend I’m making pozole, generally following the recipe in Dec/Jan issue of Fine Cooking. Hey, Big E–got an pozole tips?? Thanks much! I had forgotten about that post. I also think a big pot of pozole would be good to do for the Stringfest. Oooooooh now that’s a fine idea – Hold that thought, Girlfrien’!